Speaking of data syncing between iPhone and computer, what we first think of is iTunes of course. iTunes is the standard mate for iOS devices when referring to data transferring, but it is indeed not very ideal for transferring photos from computer to iPhone regarding the flaws. Hence, here comes the guide on how to transfer photos from PC to iPhone without iTunes to help you get out of iTunes Sync Photos errors forever. Encrypt sensitive or private pictures with password you know only. Why not Choose iTunes to Send Photos from Windows PC to iPhone? 1. iTunes Sync Photos feature only allows for folder sync, meaning that you have to collect all the pictures you want to transfer from computer to iPhone in one folder on computer and then sync them to iPhone. This way seems easy, but once you miss one specific photo, you have to add it to the folder and then proceed the syncing again, which may cost you much time if there are gigabytes of photos. 2. When transferring photos from PC to iPhone with iTunes, all the photos, music, ringtones, ebooks and other media files you synced before to iPhone will be removed totally. That is the main reason that let people seek for a way to transfer photos to iPhone without iTunes. 3. Because of the enabled iCloud Photo Library on iPhone, lacking iPhone storage space, incompatible image formats, etc, iTunes won't sync photos to iPhone problem occurs often. 4. Pictures synced to iPhone through iTunes cannot be deleted on iPhone. If you want to delete the synced photos from iPhone, you have to turn to iTunes but iTunes will remove all the synced photos at once. So, if there is any precious picture you want to remain on iPhone, iTunes is not the perfect choice. How to Transfer Photos from PC to iPhone without iTunes? 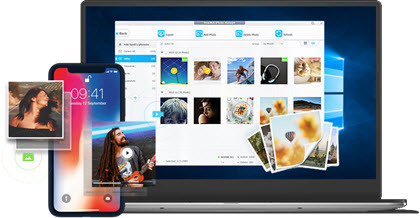 Here, we would like to suggest two common ways for you to transfer photos to iPhone without iTunes: third-party desktop application like iTunes and cloud-based service. Unlike other third-party applications which often require iTunes' installation to help data transfer, DearMob iPhone Manager is the real one that helps manage, backup iPhone media data and transfer photos between iPhone and computer without iTunes. As the best iTunes alternative, it not only features Sync Photos function like iTunes to copy pictures from computer to iPhone, but also sync music, movies, TV shows, podcasts, audiobooks from PC to iPhone easily, as well as backup iPhone with encryption. As for photo transfer, DearMob iPhone Manager comes with bidirectional sync method allowing you to transfer photos from PC to iPhone without iTunes and import iPhone pictures to computer selectively or in bulk, plus shining features like exporting iPhone HEIC to JPG, password-locking private pictures, converting Live Photo to video and still image, etc. Step 2. USB-connect your iPhone to PC, and tap Trust to continue if there is a popup message on your iPhone handset. Step 3. Click on Photo Transfer icon on the main UI of DearMob iPhone Manager to access the Photo Transfer window. Step 4. On the left bar, click on the "+" icon to create a new album, and then click on "Add Photo" to choose the pictures on computer you want to transfer to iPhone. Step 5. After choosing, hit the Sync button in the bottom right corner to let DearMob iPhone Manager transfer photos from computer to iPhone without iTunes automatically. If you need a wireless way to transfer photos to iPhone without iTunes, cloud-based services like iCloud, Email and Google Photos are good options. iCloud is Apple's native way that we should recommend first, but because of its limited free storage space and photo not syncing problem, it is not really the best choice. Email seems better but it requires you to zip your photos first if the number is large, and often the case the upload process stops accidently with unknown reasons. So, we think Google Photos that offers free and unlimited storage for photos is the most ideal one to transfer photos from PC to iPhone without iTunes and wirelessly, though the transferring process is quite complicated. Go to photos.google.com to create an account and sign in first, then go to App Store on your iPhone to download Google Photos app and also sign in with the same account. On photos.google.com, click on Upload icon to choose photos on computer to upload. 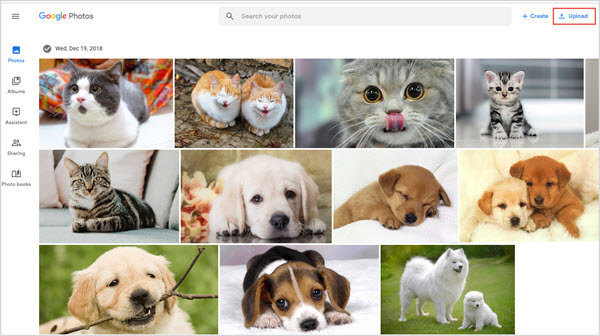 Google Photos allows you to upload high quality or original pictures based on your needs, and you can also create new albums for new photos for easier collection. On your iPhone, open the Google Photos app > select a photo > tap More and choose Save to device. If you want to download all photos you just uploaded at once, you have to download Google Drive on your iPhone first > open Google Drive app > tap Menu and choose Settings > under Google Photos, turn on Auto Add > tap Back at the top > Find and open the Google Photos folder > select the folder you want to download > tap More, select All and Download to transfer photos from computer to iPhone without iTunes. Of course, you can directly view your computer photos on Google Photos app on iPhone without downloading if you have internet. 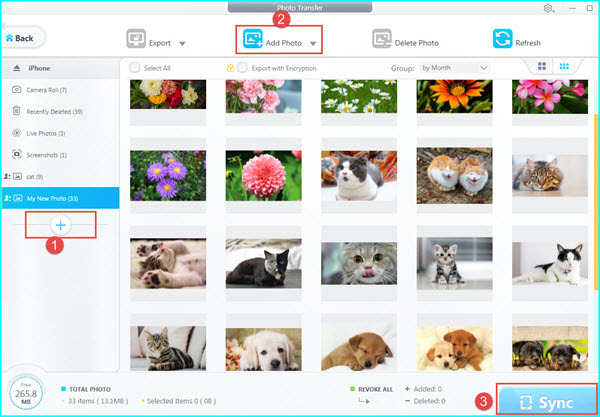 These two ways are the most convenient ones at present to transfer photos to iPhone without iTunes, and you can choose the one you like most of course. Google Photos focuses on photo transfer that is dedicated and straightforward. But if you have any other data to transfer between computer and iPhone, DearMob iPhone Manager is better to help manage, transfer and backup photos, music, videos, files, contacts, podcasts, ebooks, voice memos, apps, messages, calendars and bookmarks. How to Solve GIF Synced from iTunes Won't Work on iPhone?